Don't expect much improvement in the dense smoke for at least the next 3 of 4 days. Fires are still active and winds will keep pushing it into the valley. 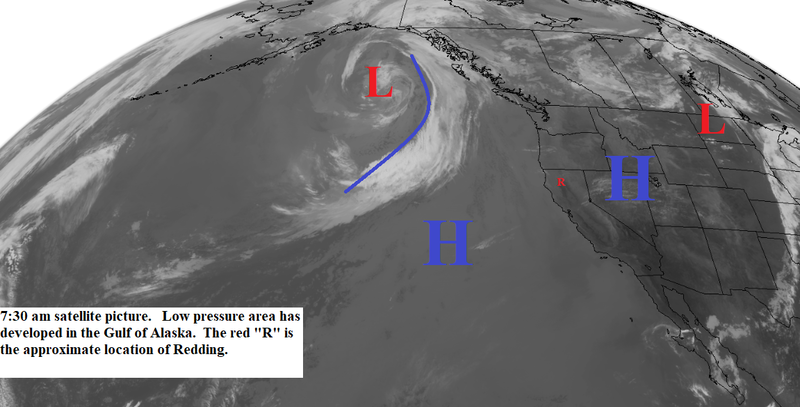 This morning's satellite picture (below) shows that low pressure trough is now in the Gulf of Alaska and off the west coast. This has temporarily weakened the high pressure area that is still over the western U.S. Today and Sunday we will see temperatures near or slightly below normal. Next week the high builds back over the west (see map below). This means a return of daytime temperatures 4 to 8 degrees above normal. Gusty southwest to northwest winds this afternoon and evening and lighter winds Sunday through next week.